In some ways I'm glad it's been a few days now since my visit to O Ya, because it's taken me this long to really decide how I feel about the place. For the unitiated, this unlikely spot near South Station in Boston has been recently voted Best New Restaurant by the New York Times, and like any good foodie I was desperate to get in on the act before, as usually happens with these things, it gets all popular and you can't get a reservation unless you're a celebrity or a billionaire. One of the potential pitfalls of visiting a new restaurant is that the service can sometimes be a bit green behind the gills, and one can only hope the kitchen's fresh enthusiasm is enough to win you over. However I'm sorry to say that although the food at O Ya was generally pretty good, often excellent, the service was the worst I've had to endure almost anywhere in the world - never mind the usually stellar levels I'd come to expect in the US. And it's this massive gulf between service and food that has made an assessment of the whole experience so difficult. Problems began as soon as we were seated, where we were forced to wait around ten minutes before our menus appeared, then another dreadfully long wait before the orders were taken. Our waiter had a habit of disappearing for fifteen minutes at a time without warning, and although I appreciate the flow of dishes was reliant upon the kitchen (some arrived two at a time, then nothing for ages) it doesn't explain why two members of front of house were there to greet people walking in off the street but there was nobody to get me a glass of tap water. It was all very frustrating. I'm not going to attempt to describe every dish I ate at O Ya because like similar Japanese restaurants the dishes were many and mind-bogglingly varied. But highlights included an astonishing bitesize portion of Uni (sea urchin), bright orange and tasting of the ocean, and a spectacular plate of chanterelle and shiitake mushrooms nestling in a sesame seed froth. Where some dishes tripped up was when they'd tried to make sushi out of luxury European ingredients - a nice idea on paper perhaps, but these things very rarely work. 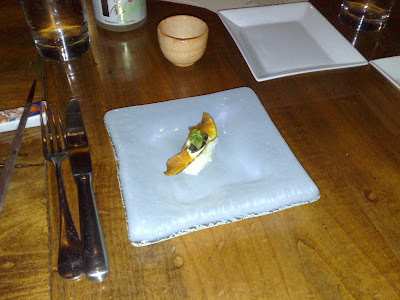 The homemade potato chip with perigord black truffle would have been lovely, for example, had it not been perched on top of sushi rice which made for an unpleasant muddle of textures - a bit like eating a potato chip sandwich. 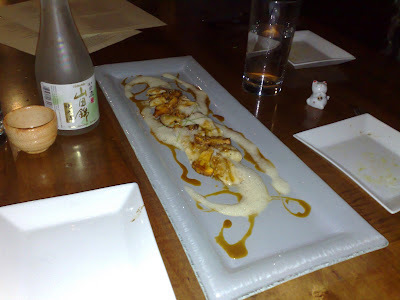 Also there's very little you can do to fois gras to make me not want to eat it, but O Ya managed it by putting a chunk of lovely seared and honeyed fois on top of some sushi rice, which in the mouth dissolved into something resembling savoury rice pudding. Pretty nasty - and a real waste of premium ingredients. In all we had around ten or so dishes each over the course of a few hours, and as you can imagine this number of individually crafted mouthfuls didn't come cheap. The damage came to almost $160 each, an eye-watering amount for us Brits, never mind those on a dollar wage. Plus we'd trimmed down the usual 20% tip so it could have been even more. However although I've been moaning about the service and the odd duff plate of food I can just about see what has been getting the critics so excited about O Ya. It's top-end Japanese cuisine, labour-intensive and precise, and I wouldn't hesitate to recommend it if the service had been anything other than dire. As it stands, I would say wait a few more months before O Ya gets its house in order - it's potentially a thrilling evening out. Just avoid the fois gras sushi. 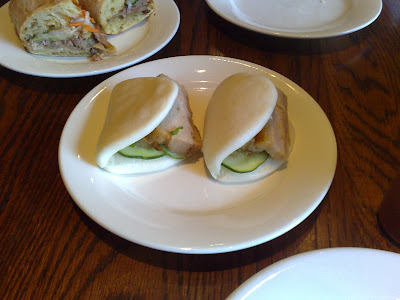 Barely a few hours off the plane, I indulged in a heavily-jetlagged lunch at Momofuku Noodle Bar (corner of E 10th and 1st) consisting of nice but fairly standard crab claws in a tangy mayo dip followed by pretty little pork belly sandwich thingies. Even through the bleary haze of a long-haul hangover I could appreciate the balance of slightly sweetened bread and tender salty meat. 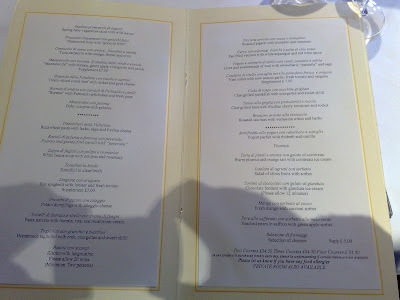 As there were only two of us and we weren't massively hungry I can't give a definitive verdict on the place, but I have it on good authority that the evening menu is extensive and even more impressive. 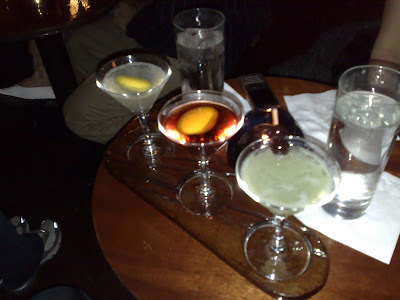 The following evening, I warmed up with probably the best Old Fashioned of my life in the Flat Iron Lounge (W 19th St). The picture, by the way, is of their "flight of fancy" cocktail taster set, consisting of a French 75, Negroni and a house concoction of which the contents escape me, but seriously if you're ever in the area you have to try the Old Fashioned - perfectly balanced flavours and a sign of a true craftsman (or woman) behind the bar. A short stroll around the corner later we were settling into the deep red upholstery of the Strip House steakhouse (E 12th St). 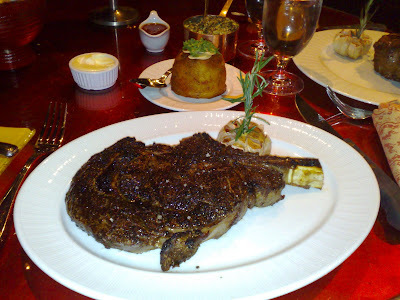 An exercise in timeless, decadent New York dining, the Strip House served me the best steak I've ever had the pleasure to eat - a huge bone-in ribeye ($44) whose crusty, salty char broke to reveal juicy, perfectly cooked beef. A question as to the sourcing of the meat turned into a short sermon on fine cow breeding from our waiter; these people really know their stuff. Then as if that wasn't enough we were served a simply stunning side of creamed, truffled spinach that remains one of the highlights of the trip. 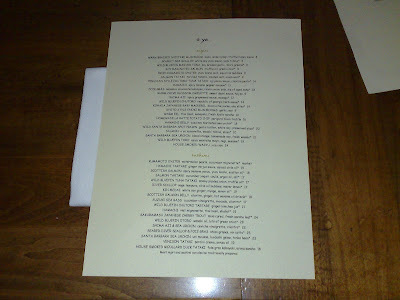 The next evening I managed, with a little help from a friendly New York foodie, to snag a table at Mario Batali's famous Babbo. For British readers who almost certainly won't have heard of him (I hadn't until I saw a hagiography on the Food Network in the hotel), Mario Batali is a huge ginger celebrity chef who made his name on the American version of Iron Chef and specialises in regional Italian cooking. His restaurant can apparently be quite tricky to get into, but the gods must have been smiling upon us as we were seated immediately. For this meal I opted not to take any photos as I wanted a night where I could at least pretend to be a normal diner for once - this means of course that I've almost completely forgotten what I ate that evening. My starter of asparagus with quail's egg was tasty and fresh, but pasta is what it's about here. 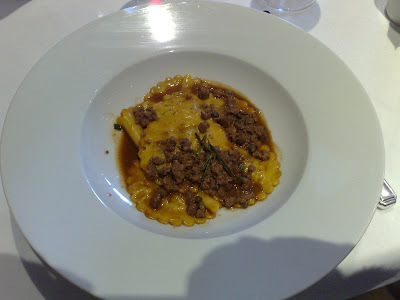 "Lamb’s Brain “Francobolli” with Lemon and Sage" was silkily homemade, fresh and delicious, almost up there with the pasta I had at Zafferano in London, and less than a third of the price. The house bread was also good, and aside from the obvious irony of coming all the way to New York City to eat regional Italian food, it was well worth the money - I believe the bill (sorry, "check") came to little more than $45 each. 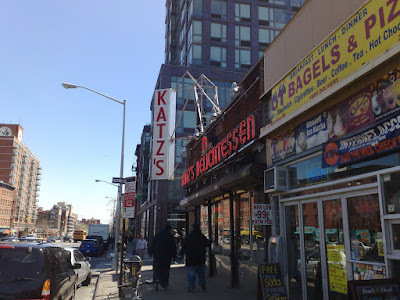 On my last day in the city, I finally got around to visiting somewhere that had been on my to do list from the last trip - Katz Delicatessen (E Houston St). 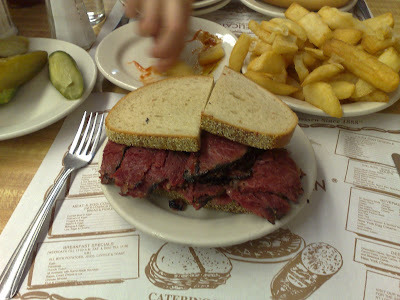 A restaurant that practically defines the phrase "New York Institution", it has been serving kosher food to New Yorkers for well over 100 years, and as far as I know has been fantastically popular for most of that time. 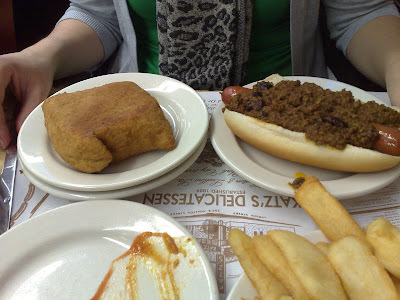 But due to the same set of issues that plagued my visit to Peter Luger's last year, I can't say I enjoyed my lunch at Katz's. New Yorkers will no doubt blame me for being a wimpy pallid-faced Brit, but when I decide to grace a restaurant with my custom, I expect to be treated like I'm doing them a favour, not the other way round. Of course, the root of the problem is that we weren't doing them a favour - Katz is going to be rammed all the time no matter how bad the service is, and they know it. And so if they order us around like cattle, throw food down on the table and avoid eye-contact, the worst that will happen is that someone else will take our place in the queue. Much like Luger's. 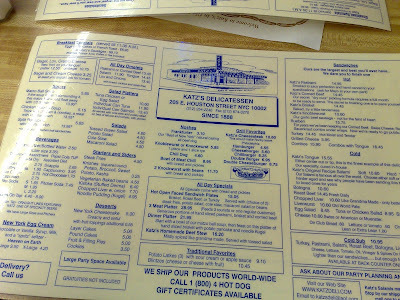 Unlike Luger's, however, the food at Katz was really not worth the effort. My pastrami sandwich was nice enough but too uniform in texture and taste to justify the huge portion, and the filling itself was actually no better than the salt beef from the Brick Lane Beigelry back home. 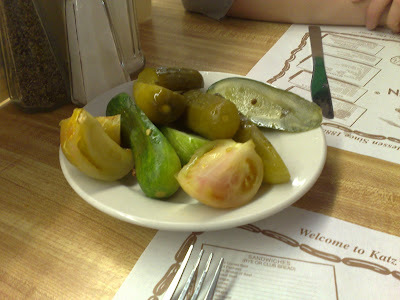 Pickels were pleasant (and free, so can't complain), but at $15 this was too expensive to be a snack, and too uncomfortable to be a meal. Still, at least now I've done it. This will not be news to anyone who has been to New York, but it really is the most fantastically easy place to eat well. Perhaps there are styles of cuisine that are rather under-represented in the city (Indian/Pakistani/Bangladeshi restaurants seem particularly thin on the ground, and from what I hear the ones that do exist aren't particularly good), but what it does do it does with style, generosity and with a smile on its face. 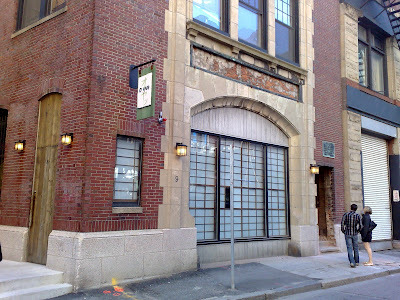 And so after four happily gluttonous days, I checked out of our hotel and caught the limoliner bus to Boston, MA. More soon. I am currently working my way through Jay Rayner's latest book The Man Who Ate the World, a hugely enjoyable read for anyone with even a passing interest in food. In the by turns hilarious and frightening chapter on Moscow, Jay makes the observation that no matter how lavish or exclusive, high-end restaurants operate a kind of twisted democracy that allows any schmuck to be A-list for a few hours, it just takes some of us longer to save up for the experience than others. While I think there's an element of truth in this (although to be fair, most of us could save up for any kind of luxury treat given enough time), the idea that London restaurants are some sort of level playing field is in my experience pretty far from the truth. For captains of industry, "it" girls and soap stars, getting a reservation at a certain infamous handful of fashionable eateries (The Ivy, Scott's and the Cipriani amongst others) is little more than a matter of asking your PR agent or waving your AMEX Centurion card. The rest of us have to make do with 6:30pm sittings and a table for two in the cloakroom. Of course, that's even if we're lucky enough to get in at all, some restaurants I'm sure being just a front for some sort of money laundering scheme (yes, I'm talking to you, Fat Duck - how can your phonelines be engaged constantly for 7 hours every Saturday for the last 4 months!?). But it's not just about reservations. 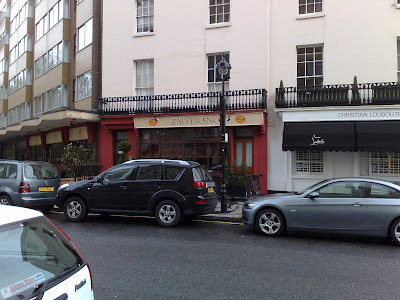 Even once seated, the heirarchy plays out in a number of other more subtle ways which became obvious during a recent trip to Zafferano in Belgravia. Rated highly by better people than me, it is also a celeb favourite so I was surprised to have the choice of any time I liked for Sunday lunch. This apparent flexibility made more sense when we arrived for our table only to be ushered through the glamourous main dining room to a pokey annexe with a decidedly non-A-list ratio of covers to floorspace. However we fared better than many other unlucky diners in the room and service was so good it soon made up for the relatively cramped corner table. 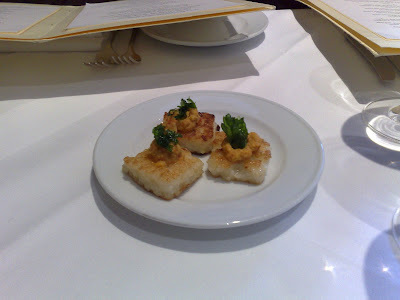 Amuse of little squares of risotto with some sort of vegetable paste were only OK but as we weren't expecting any 'extras' like this came as a nice surprise. 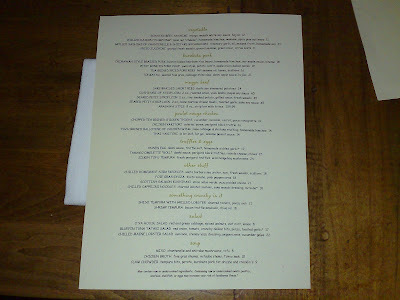 However I couldn't help noticing that some other tables - even in the B-list annexe - occasionally received further snacks such as bowls of olives and breadsticks, which weren't offered to us and weren't on the menu. Perhaps I should have slipped the waiter a fiver, or maybe they'd sussed us out from the moment we said we weren't having wine and ordered tap water. Just because I'm paranoid doesn't mean they aren't out to get me. 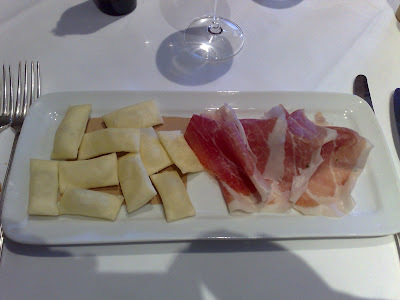 My starter of Passamonti ham with "gnocchi fritti", was literally just that - an oblong plate with little salty pillows of gnocchi at one end and some sliced ham at the other. Very good, certainly, but not really cooking as such - more like tapas than traditional Italian. The main course was, however, delicious. Polenta and guinea fowl ravioli with "peverada" was silky smooth ravioli in a fantastic stock, coated in rosemary-infused chunks of (I think) chicken livers. A rich and satisfying plate of food, and exactly the kind of thing I had in mind in my quest for the finest Italian food in London. Melvin Udall: It's not true. Some have great stories, pretty stories that take place at lakes with boats and friends and noodle salad. Just no one in this car. But, a lot of people, that's their story. Good times, noodle salad. What makes it so hard is not that you had it bad, but that you're that pissed that so many others had it good. 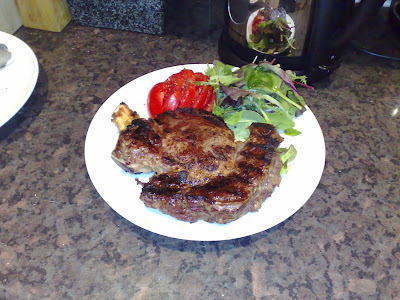 In a tribute to one of my favourite blogging reads, Dos Hermanos, and to confirm my reputation as meat-lover par excellence, over the last couple of weeks I have been attempting to cook the perfect beef steak. 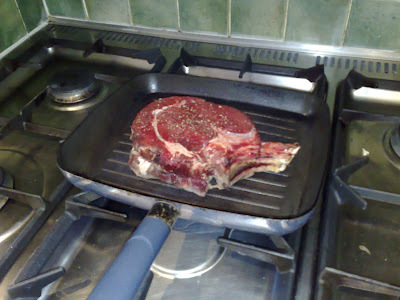 You may assume that cooking a nice steak is as straightforward a process as cooking can get, but you'd be wrong. Only on my third attempt did I achieve something approaching the kind of result you'd expect from a decent high-end steakhouse, although I think I now know why the first couple of tries failed. Attempt one went bellyup the moment I noticed the butcher in Dove's cutting the rump meat too thinly and I was too much of a wimp to say anything. I went through the motions anyway despite knowing it was all going to go badly, and of course it did - resulting in a pretty flacid piece of grey meat thanks also partially due to the fact I didn't heat up the griddle pan enough beforehand. Try two was a slightly thicker slice of ribeye which I dutifully seasoned and brought to room temperature 20 minutes before I was ready to cook it, and patted dry with a paper towel. So far so good. But this piece of meat - from Hennessey's, also on Northcote Road - just wasn't up to the job either, being quite watery and and seriously lacking in tasty fat. It also still wasn't thick enough for my liking, so was difficult to get a good crusty char on the outside without the middle cooking through. I seasoned the meat well and brought it out of the fridge around 30 mins before I was ready to cook it, all the while preheating my trusty grill pan (dry, not oiled) to volcanic levels. The extractor fan above the oven and the wide open window in the kitchen was barely enough to contain the plumes of smoke billowing out of the hob. After patting the seasoned meat dry, I re-seasoned and slapped it onto the heat. It sizzled and spluttered away very satisfyingly. After around 2 1/2 minutes, I turned it over and was delighted to see some healthy strips of black char. The smell was also incredible. After another 2 1/2 minutes I laid the steak on an oven grill tray and placed it inside a preheated oven on low heat. 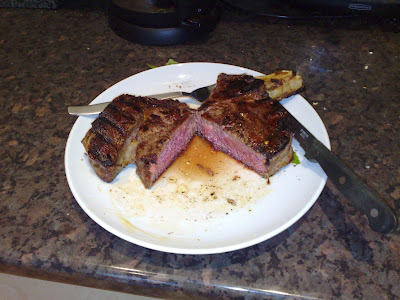 This was a tip I had picked up from the internet - to let the steak sit in its own juices, thus preserving the crispy char - and warm the meat to the middle while keeping the pink colour. The results, even through the lens of my terrible cameraphone, speak for themselves. 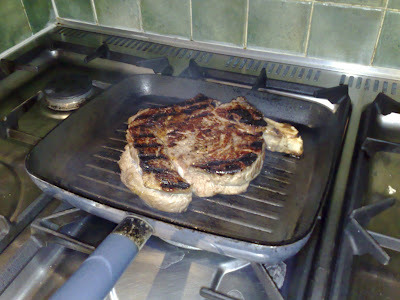 It was one of the best steaks I'd ever had the pleasure of eating, certainly up there with those on offer at Hawksmoor. Lovely crispy elements on the outside, juicy and fatty within, bursting with flavour. Fantastic. 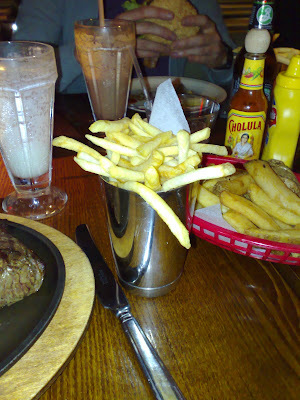 In fact I could see myself eating this on a regular basis, if it wasn't for two rather important factors. 1) There's probably enough cholesterol in this to sink a battleship and I'd quite like to make it through to Christmas without having a coronary embolism. 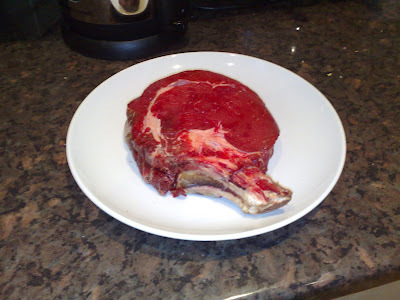 2) The steak itself cost £19 - you get a large quantity of good meat for your money, so this is not an unreasonable amount, but it's too much to justify on a regular basis. Which is probably just as well (see point 1). That aside, I hope you can forgive me for feeling rather pleased with myself just at the moment, and perhaps in a few months time when I'm feeling healthy enough in body and wallet, I will make a return journey to Clapham Common for a second helping. I think it's fair to say that most people wouldn't automatically use the words "good food" and "bowling alley" in the same sentence. 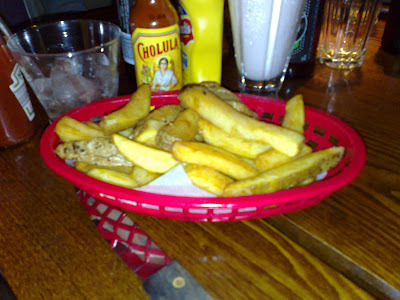 Memories of my teenage years spent at the Megabowl in Switch Island (Liverpool) are of soggy grey burgers and hugely oversalted rubbery chips washed down with buckets of weak Sprite - enough to temporarily sedate a hyperactive 14-year old perhaps but not exactly what you would call gourmet. But as with many things Americanised or American-influenced in this country, we are far, far behind in adapting to the latest trends and improvements. 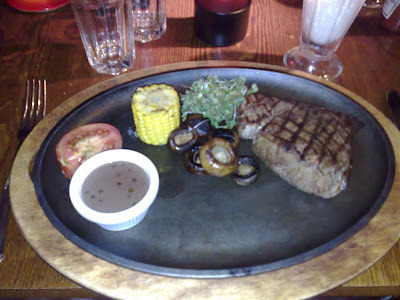 Consider for example that Hawksmoor is the first proper (reasonably affordable) US-style steakhouse I've been to, and it only opened in 2006. 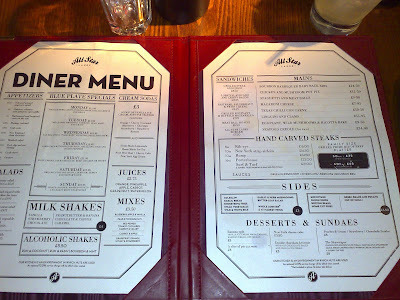 And while the not-exactly-Einsteinian concept that people might want some decent grub alongside their game of ten-pin bowls was picked up on long ago stateside, it has taken (as far as I can tell) until the opening of All Star Lanes in Bloomsbury for the people of London to appreciate the same. 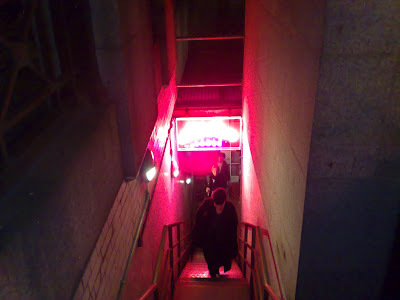 Tucked away down a neon-lit stairwell somewhere under Southampton Row, visitors to All-Star soon find themselves in a pleasantly decorated low-ceilinged space with a rather exclusive feel. The theme is 50s American so there are lots of pin-up cartoons on the walls and waitresses in funny wigs. The bar was a nice spacious area to enjoy a pre-dinner cocktail although the standard of the drinks themselves varied very much on which barman you got - my first margherita was lovely and sharp with a frothy lime surface, the second oversweet and flat. 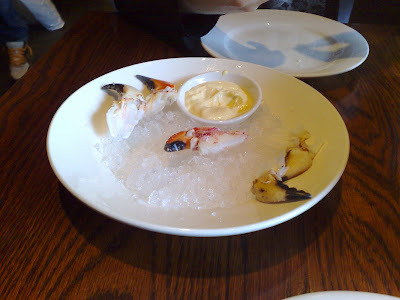 As for the food itself, this was generally of a more consistent quality. 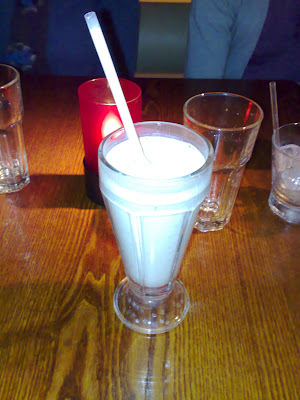 Star of the show as far as I was concerned was a brilliant Bourbon and Mint Milkshake, although whether you consider this technically 'food' is up to you. But skin-on homefries were also excellent, as were the burgers (I was told) and the cheese quesadillas. After Hawksmoor I'm afraid many steaks suffer in comparison and the rump here was no exception, cooked to the required rare but with no crispy char and consisting of tasteless, watery meat. 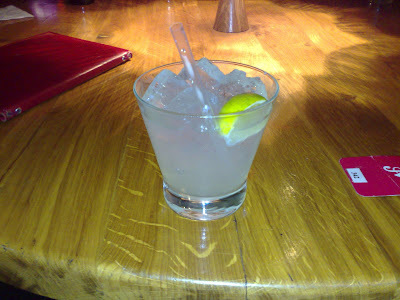 My biggest problem with All Star wasn't the food or the drinks however, but the service, which was brusque verging on downright rude at times. After waiting a very reasonable ten minutes for my milkshake I politely asked the waitress of its whereabouts - "It's just coming! ", was the belligerent reply, "the chefs make it from scratch, you know". Well, I would rather hope they would, but it's only a milkshake, not a Baked Alaska. Perhaps they were milking the cows by hand. Later on, as the effects of rounds of house cocktails and alcoholic milkshakes had their effect, the noise levels increased dramatically and I wouldn't recommend the venue for a romantic dinner for two. Most of our fellow diners appeared to be corporate-account office parties - indeed an entire section was booked for Merrill Lynch whose overindulged revellers were later making enthusiastic use of the gents to regurgitate their evening meals. But as a lighthearted night out where nothing is taken too seriously and nothing is too bad to really be worth complaining about, there is a lot going for All Star Lanes. I'm not in the habit of trawling the unlikely South Western suburbs of London for a good meal, but fortunately on this occasion I had someone else to do the research for me. 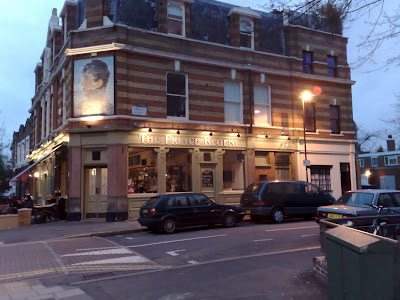 There are few things more valuable than a recommendation from a foodie friend, and so off we trotted on a warm spring evening to the Prince Regent, a tastefully renovated space on the Dulwich Road which I'm told used to be the grottiest of old-man boozers but now was all light and space, solid pine furniture and cut-glass interiors. 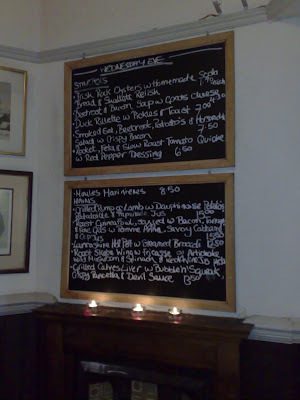 The daily menu was scribbled charmingly (and mildly illiterately) on a couple of blackboards on a wall of the restaurant. There was no printed version, so throughout the evening groups of diners huddled around the handwritten menu like anxious students checking exam results. I was immediately interested in the homemade soda bread, but unfortunately the accompanying oysters would have probably sent me straight to hospital so instead I plumped for the smoked eel salad. 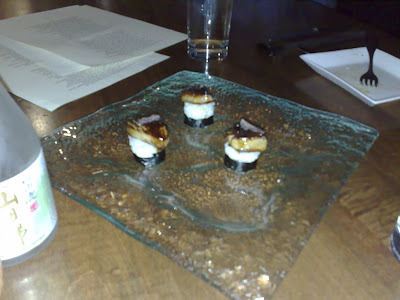 A bit of a curate's egg of a dish, the eel itself was gorgeous, delicately smoked, firm but moist. However the sauce was unpleasantly fizzy and although I'm sure this was just a side-effect of mixing mayonnaise with horseradish rather than it being off, it was quite disconcerting. A couple of slices of lovely crispy bacon on top did wonders to make amends though. 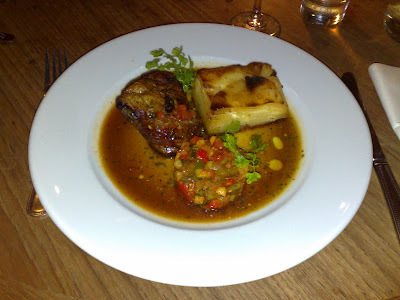 Main course of lamb rump and ratatouille was an assuredly accomplished bit of cooking. Other than the lamb being rather messily butchered, I could hardly fault this dish. Dauphinoise potatoes were rich and seasoned to perfection, the ratatouille was a satisfyingly straightforward but nonetheless tasty addition, and the lamb itself was as pink and juicy as you could want. 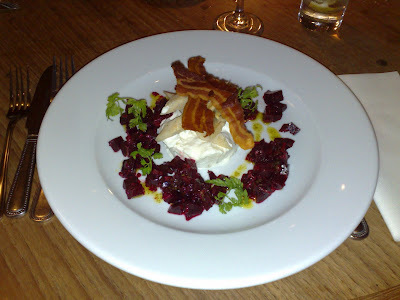 And so, another very deserving London neighbourhood gains a thoroughly respectable new gastropub. Well worth the trip to the outer boundary of Zone 2, the Prince Regent lives up to its name as a regal and dignified establishment.